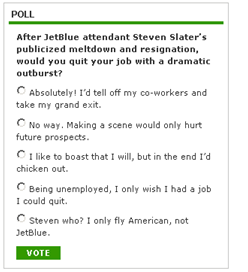 After hearing about how Steven Slater quit his job on JetBluethe other day, it is hard not to be reminded of the famous scene from thestoner-flick Half Baked where Scarface quits his job at a fast-food joint bycursing out his shift mates over the intercom, throwing a burger at a customerand leaving. Half Baked is a movie. In real life, Mr. Slater got into an argument witha JetBlue passenger, was hurt in the incident andcould not let go of his anger when the passenger further fueled his rage as theflight came to a halt. Slater would curse this passenger out over the PAsystem before he grabbed his own bags, swiped some beer, activated theinflatable emergency chute, slid down, and went home. He has since becomea hero. Recent comments from “people on the street” suggest that theywould like to leave their job with similar flair. Mr. Slater is enjoying his 15 minutes of fame, butunless he is able to parlay this into a well-paying gig, his career outlooklooks bleak. What airline would hire Mr. Slater after hearing about hisrecent outburst, especially with the knowledge that he might be quick to snapat another passenger given his open contempt for those that try to skirt thecarry-on baggage rules? Airlines aside, what company would want to hiresomeone who cursed out a customer, showed a perceived disregard for theirsafety and despite all this, still made sure to steal some beer on his way outthe proverbial door? Never Quit Out of Anger: Think before you make a decision to quit. We are still dealing with anunstable economy and you need to know which companies are even hiring before you thinkabout leaving your current job. Without a backup plan, you will regretyour decision. Especially when you can’t collect unemployment, havetrouble finding a job and realize that you cannot pay your bills. Breathe. Have a Backup Plan: You may want to have a job to go to before actually taking action. Update your resume and your LinkedIn page, reach out to your contacts and startyour job search. When you have an offer and know for sure that you willhave money coming in, it’s time to get the ball rolling on leaving your currentsituation. Don’t Burn Your Bridges: Write a thoughtful letter of resignation and discuss what you have learned andwhat you appreciated about your time at the company. Try to glaze overany negative reasons for leaving with words like, “I feel after so many years,it was time to take on a new challenge.” And despite writing a letter,make sure you speak with your supervisors. Kill them with kindness. Give Ample Notice: Thestandard is usually two weeks, but if you are a vital person that will be hardto replace, and you’re not going to start at Company B in a month, you shouldbe open to the idea of giving more time if needed. If you are justquitting, because you just want to take a break from working, you should bereceptive to the idea of working longer than two weeks until they find a replacement. Set parameters and give deadlines, because some companies might take advantageof your generosity. Stay in Touch: Evenif you are working for a different company, it doesn’t hurt to shoot an emailwishing your previous employer well during the holidays or just because youwant to show you still care. And if you have friends at the company, social networking allows you to stay in contact andkeep up with the latest gossip. If the situation arises, you may want togo back to work for your previous employer and this is your best opportunity tokeep your name in their heads and be in the loop should a position open. And finally, if you feel the need to slide down an emergencychute…just go to the park – they have slides, too. Will Economic Recovery Cause Employees to Quit?